Three borders of an elementary cellular automaton evolution can be used to compute a new initial condition for a modified evolution. The upper plot gives the current evolution. The middle plot illustrates the computation of the next initial condition. The lower plot gives the next patch step. 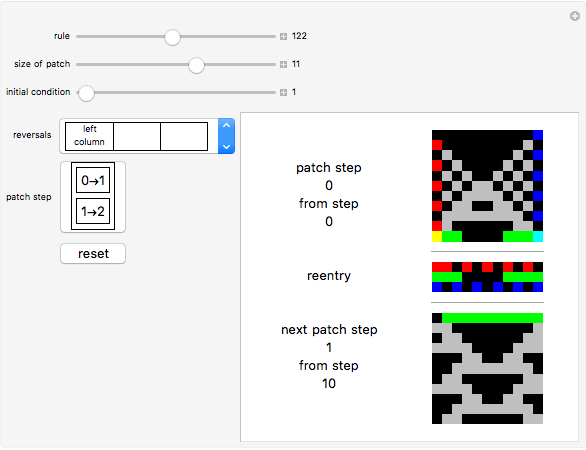 The initial condition of the next evolution patch is computed using the left, lower, and right borders of the previous evolution patch and then illustrated by rendering 1-bits in the top row of that lower evolution patch as green pixels. 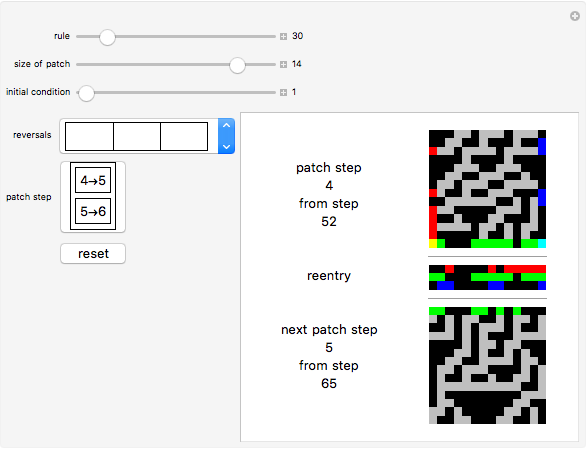 The left, bottom, and right boundaries of an evolution patch give the bits for the initial condition of the next patch step as results of the cellular automaton function applied to three bits. Red left border bits are taken as the left neighbor bits, the bits in the green last row of the patch are taken as the center cell bits, and the blue right border bits from the patch are taken as the right neighbor bits. The 1-bits in the lower left and right corners of the patch are included twice and colored yellow or cyan accordingly. These three input vectors can be reversed or not, in eight different ways. This reentry can sustain patterns; for instance, non-plain triangles in the upper rows of evolutions which follow rule 122. Michael Schreiber "Patch Reentry of Elementary Cellular Automata"